This HaRGB image shows approximately 5 degrees by 4 degrees of the constellations Gemini and Orion. At the top of the image is IC 443, the Jellyfish Nebula. This nebula is almost a full degree in diameter, and is quite faint. IC 443 is the remnant of a supernova that exploded some 8,000 years ago. In addition to the expanding shell of gas, the explosion left behind a neutron star which shines brightly in both X-ray and infrared portions of the spectrum. Above the Jellyfish Nebula is the even fainter and more subtle emission nebula, Sharpless2-249. At a distance of 5,200 light years, this nebula is a few hundred light years farther than the Jellyfish Nebula. 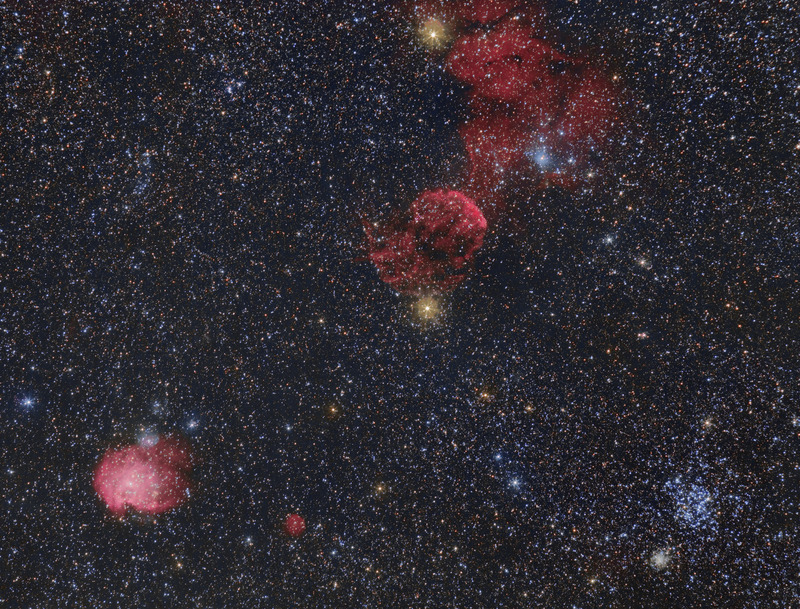 Astronomers believe the two nebulae are interacting. In the lower right corner is the open cluster, M35. Its bright blue stars identify it as a young cluster, as astronomers date this cluster to be a mere 150 million years old. The cluster contains about 2500 members spread across about a quarter of a degree of sky. Adjacent to M35 is the much smaller and more compact open cluster, NGC 2158. This cluster is about 4 times as far as M35. The cluster is much older than M35, as its bright blue stars have all burned out. Resultantly, this cluster is markedly less blue than M35. In the lower left of the image is the large emission nebula, NGC 2174. The nebula is commonly known as the Monkey Head Nebula, due to its uncanny simian resemblance. Embedded within the half degree wide nebula is the open cluster, NGC 2175. The stars in the cluster are being formed from the contracting gas within the nebula. Software Used Images Plus 5.0 for camera control, calibration, stacking, digital development, star shrinking and halo reduction, smoothing and noise reduction. Photoshop CS5 used for levels and curves, high pass filter, star shrinking, lab color, saturation adjustments, and selective color. Gradient Xterminator for gradient removal. Carboni Tools for additional noise reduction, and smoothing. Registar for aligning stacks and for color channel alignment. HLVG for additional color correction. Notes It took me quite awhile to process this image, as I'm still refining my techniques for combining Hydrogen alpha data and RGB data. While I'm not thrilled with the overall color, I think its a pretty good start. The field of view is quite spectacular, harboring such a broad range or targets. This image was published by Astronomy Magazine as its Picture of the Day for November 2, 2016!